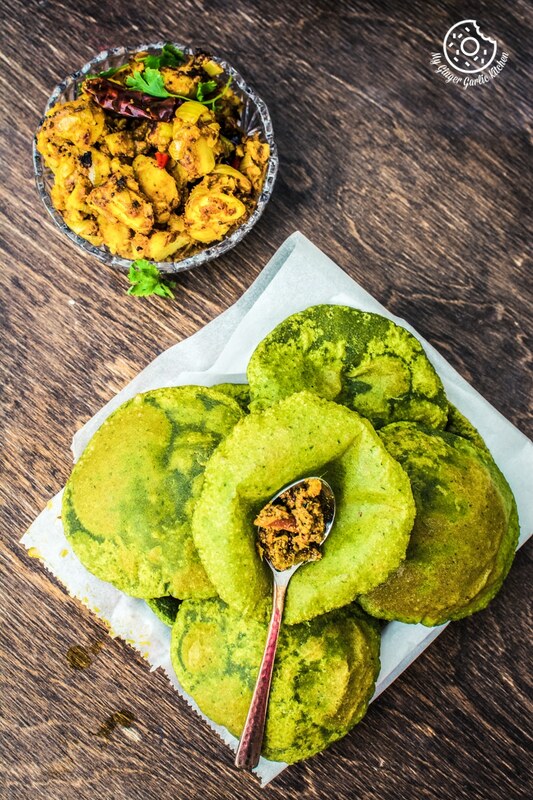 Palak Ki Puri Recipe Video | How To Make Palak Poori | Spinach Puri — This is a deep fried puffed up Indian bread made with ‘atta’ aka whole wheat flour and spinach puree. These are best served with any curry for a perfect balance of spicy and savory. Happy Friday Guys! How’s life at your end? Here, life’s pretty exciting, weather-wise too. We woke up to the pretty white wonderland yesterday. Yes, the first snowfall of this season is here. It snowed heavily all day and night yesterday. And I am so thrilled to announce that we happily bid adieu to the Autumn officially. Life is going to be in black and white for 6 months and I am loving it. I am not a BIG fan of long cold and dark winter though, but the arrival of winter is always so amusing to me. I just can’t stop looking at the serene sight outside of my window when everything is white. Little A: “It will be there Mommy, you’ll see in the morning”. And as soon as she woke up, she ran to the window to look whether the snow was still there. And when she saw so much snow she came to me and started jumping with joy saying, “Yeahhhh, the snow didn’t melt. I knew it. I told snow not to melt and it listened to me. Now I will make snow butterflies today”. Currently, I am sitting on my work table, sipping my favorite hot coffee, taking a glimpse of white snowland outside through a big glass window from a height and writing this post. This is what I call “Live life to the fullest. This is pure zen”. What else could I ask for a refreshing morning? Right? 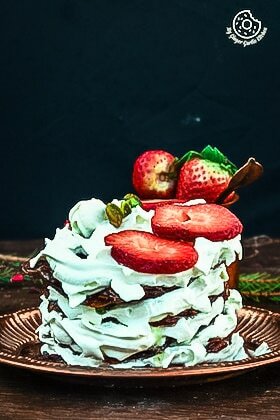 Let’s talk about today’s recipe. 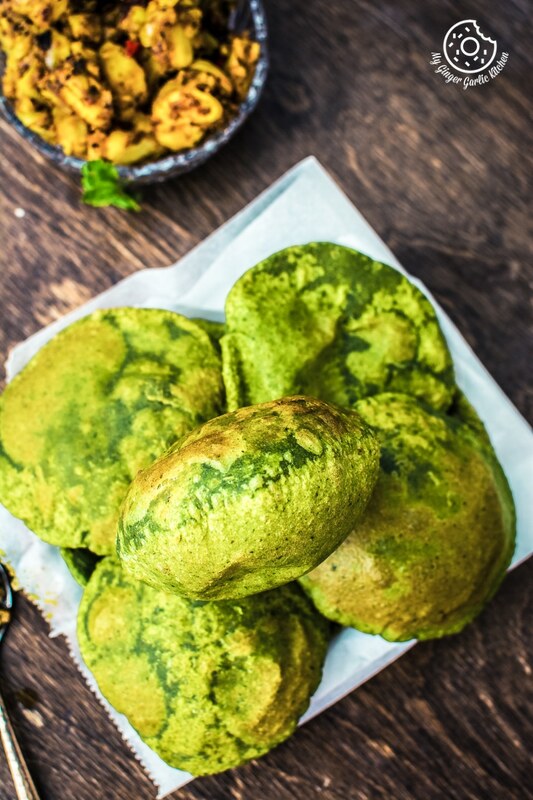 This is Palak Ki Poori I was talking about in my previous post, ‘Aloo Poori’. What is Poori in General? A basic Poori or Puri is a deep fried puffed up Indian bread made with ‘atta’ aka whole wheat flour. Poori, in general, is a popular deep-fried bread eaten mainly for breakfast. I would recommend using canola oil aka rapeseed oil or sunflower oil for frying pooris. This way you will get lighter and less greasy puri. 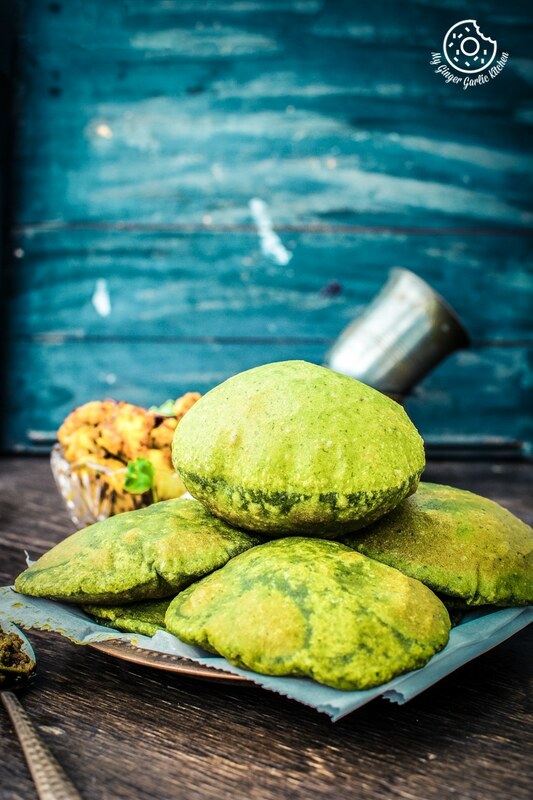 Palak Puri or Palak Ki Poori is made with a nice combination of spinach and wheat flour. Any kind of poori is usually served as a breakfast, but you can have them for lunch or dinner as well. Also, this is great lunchbox recipe. First, you add blanched and pureed spinach to the whole wheat flour and make a dough. Second, you add finely chopped spinach to the whole wheat flour and make a dough. Either way, this poori tastes fabulous. I personally like the pureed one because it gives a uniform nice green color to the puri. 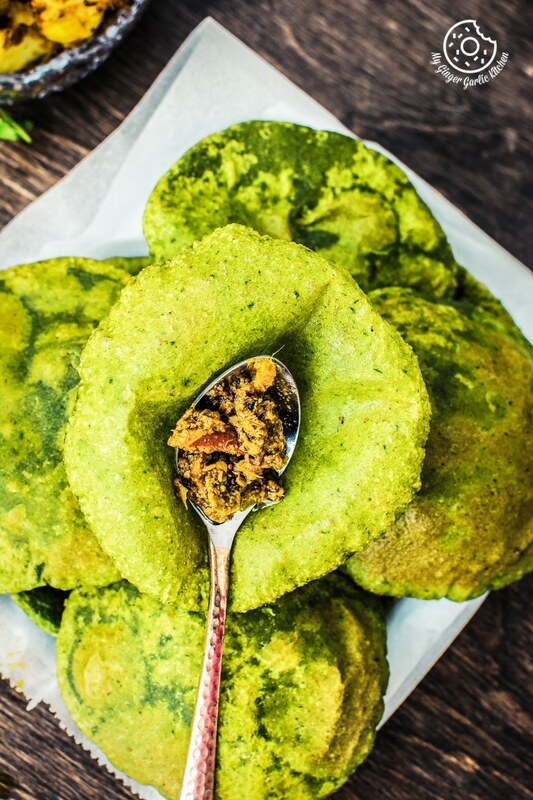 You can serve this palak puri aka spinach poori with any curry or pickle. I personally like it with Amritsari Chole, Palak Paneer, Achari Aloo Gobhi, Restaurant Style Shahi Kaju Curry, Rajasthani Besan Gatte Ki Sabzi, Restaurant Style Paneer Butter Masala, Restaurant Style Matar Paneer, Egg Drop Curry, Restaurant Style Paneer Do Pyaza, and Lehsuni Dum Aloo. 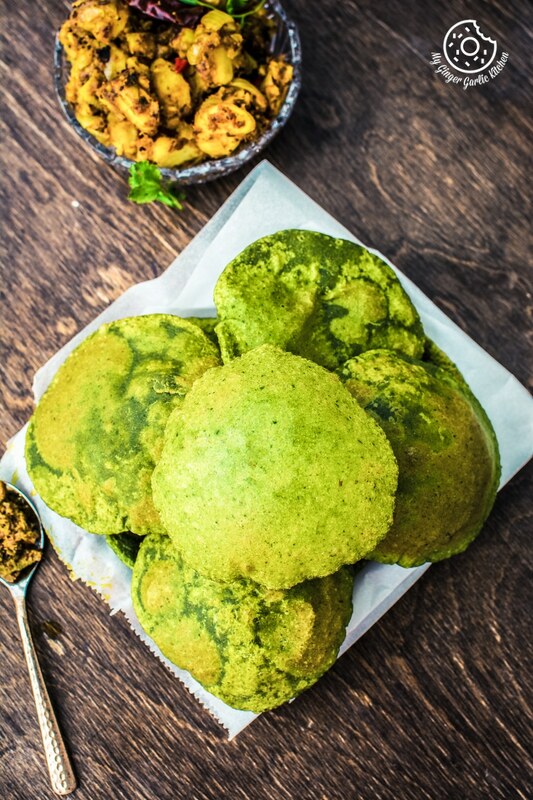 This Palak ki Poori or Puri is not just an average puri. 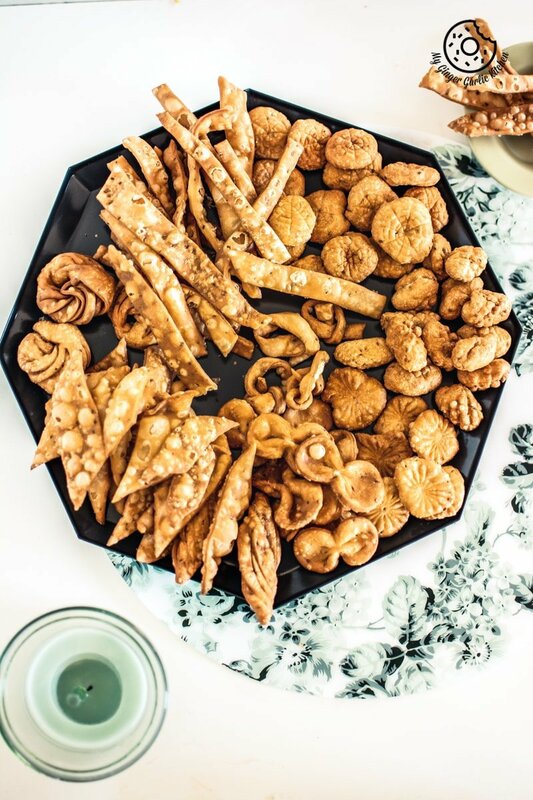 It’s an appealing and flavorful fried bread. 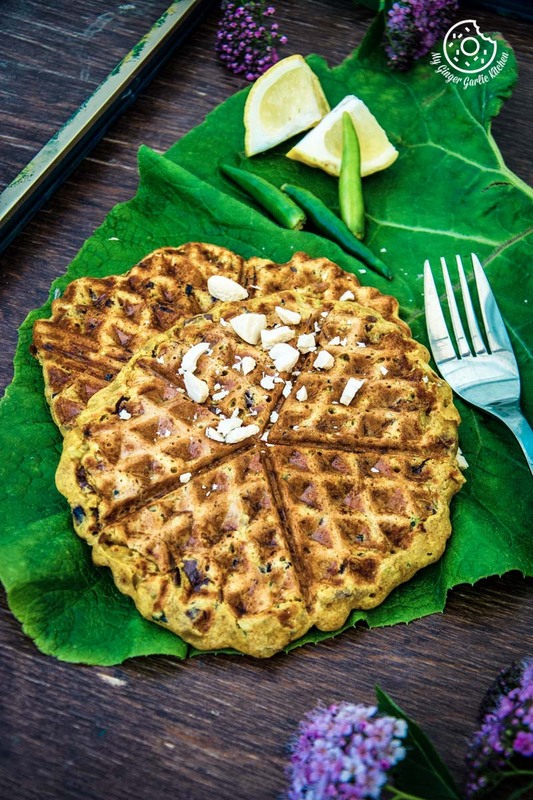 And it’s made with only 4 key ingredients — spinach puree, cumin seeds, ginger, and wheat flour. 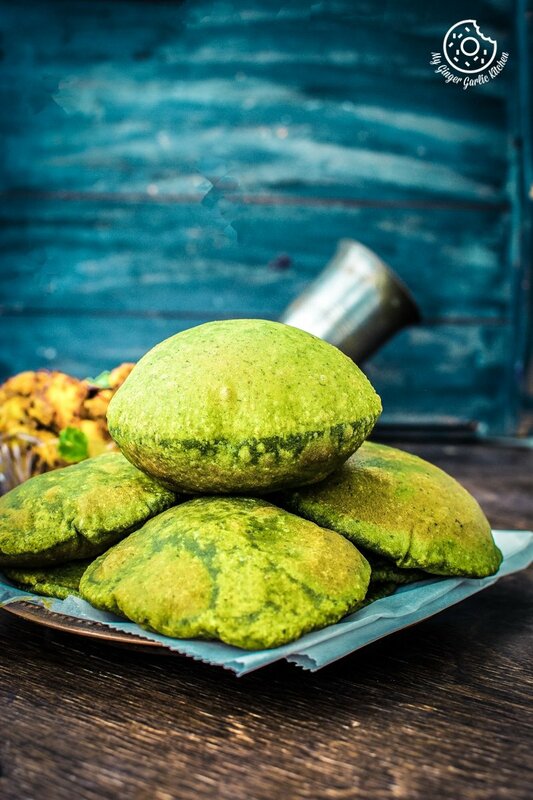 Palak ki puri is definitely not a light bread, but this is so full of spinach goodness. 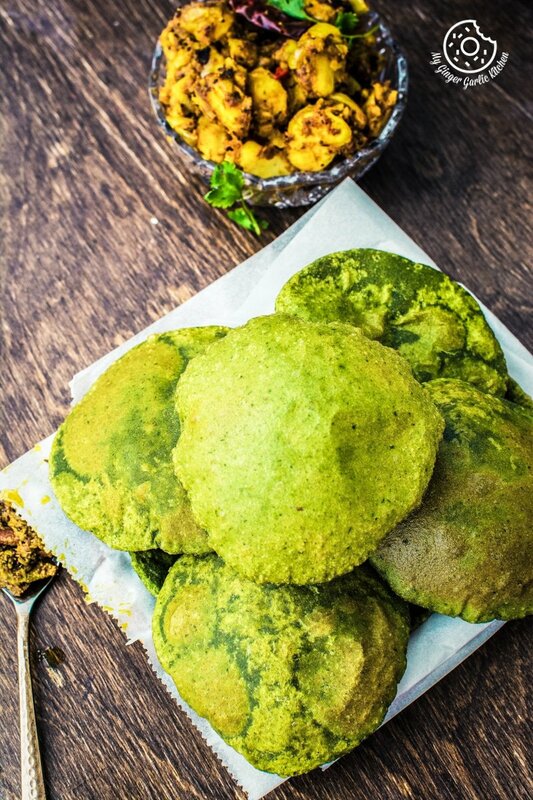 Anyone who doesn’t like spinach at all would love this Indian bread. Kids won’t even bother to know that there is any spinach in it. Little A loves it without anything. Whenever I cook this palak ki poori, she takes the hot puffed pooris and eats them without anything. She reminds me of my childhood. Even now, I do the same thing while frying pooris. Yes, these pooris are that good. 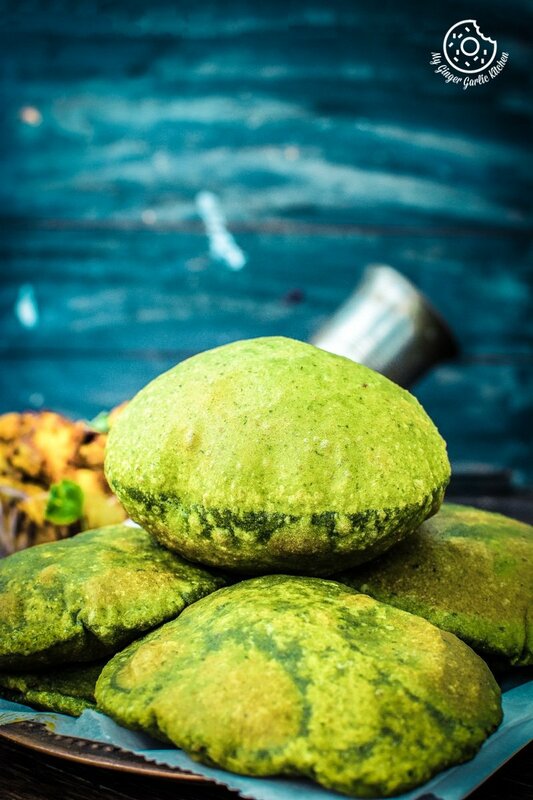 This poori comes with a nice flavor of spinach and hints of ginger and cumin. These are best served with any curry for a perfect balance of spicy and savory. 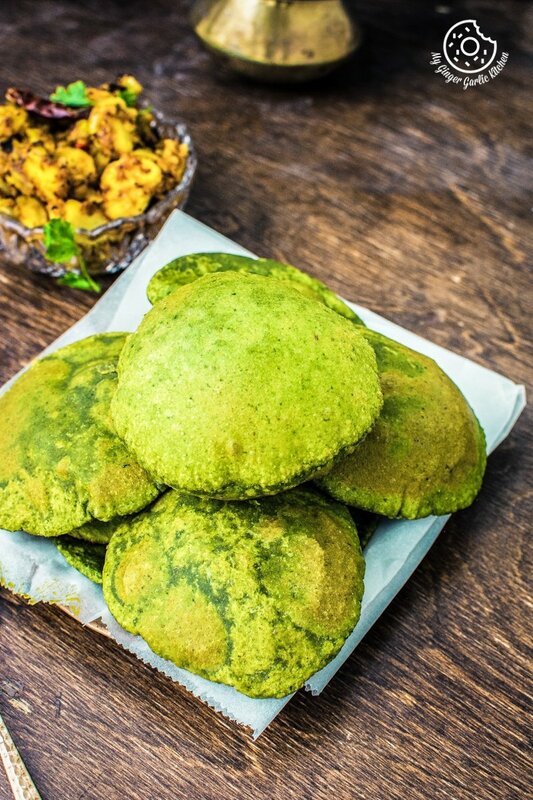 Let’s learn how to make Palak Ki Poori by following these easy steps. 1. Add blanched spinach, cumin seeds, and ginger to a blender and blend to make a smooth puree. 1. Combine the whole wheat flour, salt and 2 tbsp of oil and mix well. 2. Add spinach puree little at a time and knead into a stiff dough. 3. Cover the dough with damp cloth and let it rest for 30 minutes. 4. Divide the dough into 3 equal portions and roll out each portion into a thin log as shown in the video. 5. Heat enough oil in a pan for frying. 6. Cut each log into ½-inch pieces and roll each piece into small rounds of 5-inches diameter. 7. To check if the oil is hot enough, add tiny dough pieces to the oil, if it rises up immediately then the oil is ready. 8. Now put one rolled out poori/puri into the hot oil and lightly press it with a spatula so that it puffs up. 9. Fry them till they turn golden brown in color from both the sides. 10. 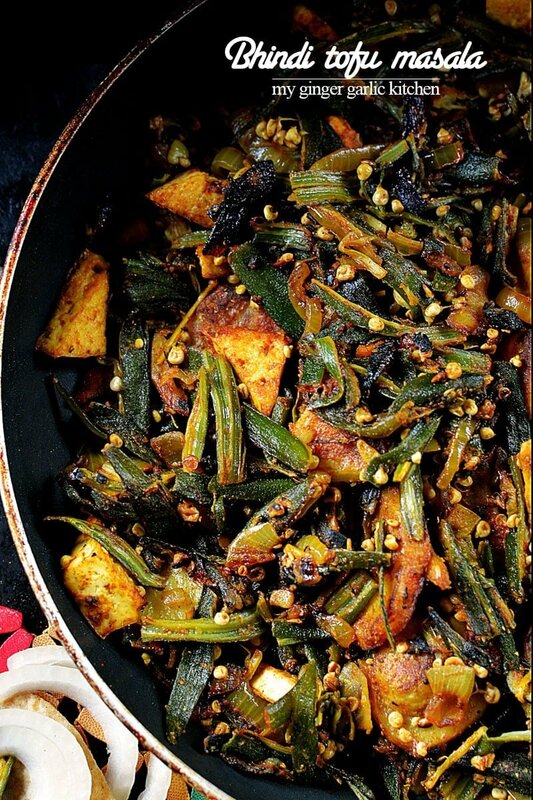 Transfer to a kitchen towel and serve with Aloo Tamatar Ki Sabzi or any Chutney.